This course will help you come back to yourself. Sometimes we get lost. We find ourselves in strange places, far away from anything that feels familiar and true. We’ve been following paths that are not our own, seeking wholeness in places that can never satisfy us, and ignoring the whispers of our own longing. It happens to almost every woman at some point in her life. Too many distractions get in the way. She pursues a career that others have told her would be practical and financially sustainable. She sacrifices too much for her children and forgets to pay attention to what she herself wants in life. She gets stuck in a pattern of looking after everyone else’s needs first. She ignores her own feminine wisdom because she’s been told for so long that she’ll get further if she acts like a man. She feels safer following the patriarchal religion she’s been raised with rather than pursuing the Feminine Divine that everyone in authority tells her to mistrust. How does a woman come back to herself? She needs to go inward – to take the spiral path that leads to her heart. She needs to learn to listen to the wisdom written on her own heart rather than that which others thought was best for her. She needs to find stillness into which the Spirit can speak. And she needs to find sisters on similar paths who will support and encourage her. 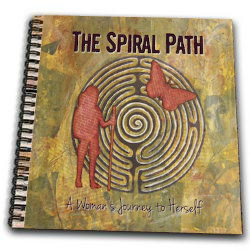 The Spiral Path: A Woman’s Journey to Herself is an e-course meant to help women find themselves again. Through a series of inspirational lessons, creative prompts, and journal prompts, you’ll be invited on a journey that will take you inward, to your own sacred Self. It’s a self-study, but you’ll also be welcomed into a private group where you can share the journey with others. 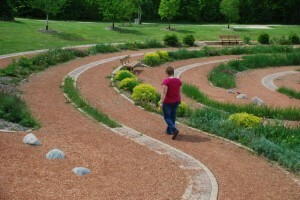 The Spiral Path is a virtual labyrinth walk. 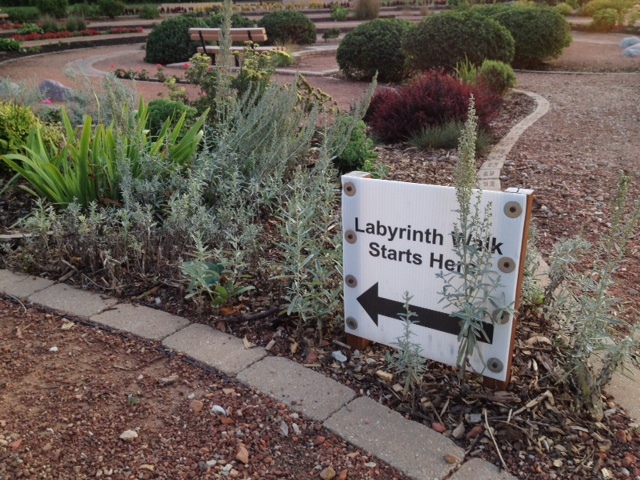 There are three stages in a labyrinth walk. First, when you journey inward, you release the burdens you were carrying and whatever distractions got in your way. Then, when you reach the centre, you are ready to receive whatever wisdom and guidance is waiting for you. Finally, you return from the centre, making the journey outward and bringing with you whatever new gifts and wisdom you’re meant to share with the world. These three stages help frame the journey through The Spiral Path. You’ll receive twenty-one lessons in The Spiral Path. The first seven will focus on releasing. You will be invited to release your need to control the outcome, your expectation of a straight path, your old stories, your fear, your concern about what others think, your tears, and whatever no longer serves you. The next seven lessons will focus on receiving. You will practice receiving stillness, healing, curiosity, the Sacred, your Divine Assignment, and whatever you need for the return journey. The final seven lessons will be about returning. You’ll be invited to return to yourself with your God/dess, your strength, your circle, your gifts, your longing, and your courage. If you want to learn more about labyrinths, you can listen to a free recording here. NEW: You can now sign up for The Spiral Path any time you want and start the lessons right away. No more waiting until the next time it’s offered. A teaching on one of the themes, including stories, tips, and other resources. A creative prompt that will invite you to deepen your understanding of and engagement with the theme through creative expression. (Many of these will be based on mandalas and labyrinths.) These will be simply enough for anyone to do – you don’t need to be an artist. Journal prompts that will invite you to explore your own thoughts on the theme. Ideas for body movement, ritual, or other ways of engaging with the theme in a holistic, body/mind/spirit way. When you sign up for The Spiral Path, you’ll receive a welcome email, and then you should receive the first lesson within an hour, followed by a lesson each day for 21 days. Note: There will be no restrictions on how quickly or slowly you move through the material. If, at some point, you need to pause for reflection and/or self-care, you can always come back to it when you’re ready. A link to the page where everything is housed will be provided to everyone and the content will stay there for the indefinite future. 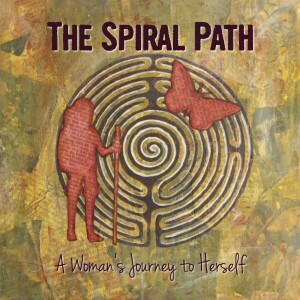 The Spiral Path: A Woman’s Journey to Herself is inspired by my own journey. My life was changed when I began my spiral journey fourteen years ago, and now I want to serve as your guide and creative host as you take your own journey. I believe in this work wholeheartedly and I believe that it is the truest expression of my own Divine Assignment. I believe that women need to awaken to themselves and to their spiritual longing. I believe that awakened women can help change the world and bring us back into better balance, where the sacred is honoured in each of us, where the earth is treated with greater respect, where connection comes before commerce, and where the feminine is in better balance with the masculine. There are two ways to register for The Spiral Path. Note: The prices have recently been adjusted from US to Canadian currency, so although they look higher than they were, they are actually a little lower (due to our dropping currency value). 21 lessons which you’ll start receiving as soon as you sign up. A special journal with the artwork for The Spiral Path on the front, with blank unlined pages inside. The journal is square (8.5″ x 8.5″) to accommodate the circular nature of many of the prompts (e.g. mandalas & labyrinths) . There are 50 blank pages inside and the paper is heavy to avoid bleed-through. Templates on card stock (of a spiral, labyrinth, and circle) tucked into the back of the journal for tracing when you need those shapes for the prompts. Special offer for groups: If you want to sign up with a friend or your women’s circle, email me with that information and I will provide you with a special coupon code that will give you each a 10% discount. 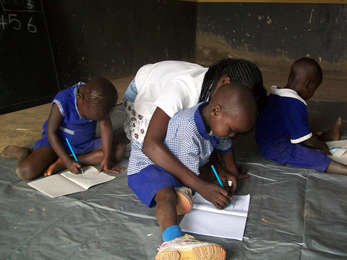 Important note: $5 from every registration will go toward supporting a school in Uganda. My friend (and former intern) Nestar Lakot Okella started the school (in the region where she grew up) less than 2 years ago and is already educating more than 100 children. You can read more about my commitment to helping her here. 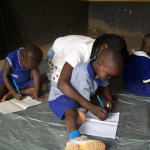 Not only will be you finding your own path when you sign up for The Spiral Path, you’ll be helping a child in Uganda find hers (or his). If you have any questions about The Spiral Path, please feel free to contact me. Refund policy: If, after the first 3 lessons, you are not satisfied with The Spiral Path, you will be refunded your registration minus a 15% administration fee. If you have ordered the journal, you will be required to return it unused (at your cost) before the refund will be issued. Sign up any time you want and start receiving the lessons right away. Note: If you don’t receive anything by email within 30 minutes, check your spam & promotions folders. If nothing’s there, contact me and my assistant Krista will be happy to help you.